Diablo the Movie has been announced! Re: Diablo the Movie has been announced! They have to warp in things from somewhere. For all of their stable vehicles and weapons to suddenly become obsolete seems kind of unusual. I mean, just retrieving all of the Colossi alone would be a fairly big undertaking. Doctor Doack wrote: They have to warp in things from somewhere. For all of their stable vehicles and weapons to suddenly become obsolete seems kind of unusual. I mean, just retrieving all of the Colossi alone would be a fairly big undertaking. God I'm fat, just shoot me. Whatever Blizzard does, does not conflict with their lore, afterall they have created the lore themselves. 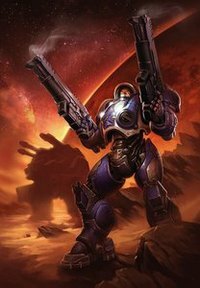 Marine 382BB wrote: Whatever Blizzard does, does not conflict with their lore, afterall they have created the lore themselves. No, it does, it's not their lore anymore, it's the lore of the public, the fans. That's like saying Da Vinci can come back alive and decide he wants to draw a mustache on the Mona Lisa. He can't, it's the public's art now. Haven't you ever seen the episode of South Park where they keep rereleasing movies with edits and the boys go on a quest to stop this because it's no longer the director's movies? Blizzard will only anger (and at some point make people stop playing, I've seen it) it's fanbase over some ridiculous moves they may take. Spaceships? Next thing you know a cheese grader will be the worship idol for humans as the Cheese family is the REAL royal family.. Because it makes the lore work better for the game. Ah, I never knew it was the Public Lore, but they can alter the timeline such as the Infinite Dragonflight that messes with the time at the Caverns of Time, but of course we have no real reason why they are there. Marine 382BB wrote: Ah, I never knew it was the Public Lore, but they can alter the timeline such as the Infinite Dragonflight that messes with the time at the Caverns of Time, but of course we have no real reason why they are there. Public is a figure of speech. It means it's been publish, so what morals do they lack to actually have the urge to alter the lore everyone's come to love to suit a GAME instead of a UNIVERSE. Haha, I found out that said guild split in half. Guess they weren't as stable as they wanted everyone to believe. Changing something due to time travel and all is still lore ok, but changing a fact and saying 'what you knew never happened', that's wrong Marine. Oh come on, you know what I mean. Besides all that, 1985 was the good year, 1984? Just doesn't have that ring to it. I wasn't even alive in the 80's. 1984 is my favorite Orwell novel. RazorclawX wrote: 1984 is my favorite Orwell novel. We share taste. Our school requirement was the first "book" read by the end of the year, I finished the three "books" by the end of the month. Outstanding novel. Animal Farm was interesting as well, though I was too young to understand the complexity of things when I read it.